Now that you have everything you need, you’re ready for your first Unity project with Visual Studio. 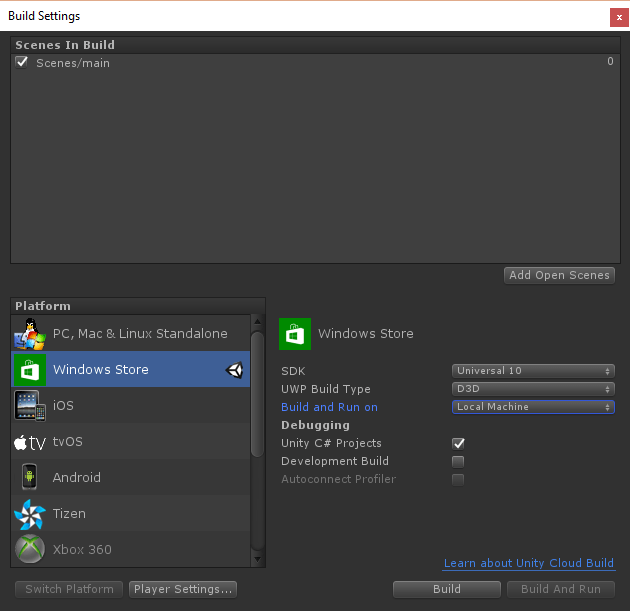 Setting up your Unity project is different depending on which versions of Unity and Visual Studio Tools for Unity are installed. Follow the steps below for the version of Unity and Visual Studio Tools for Unity that you have installed. Starting with Unity 5.2, you no longer have to import the Visual Studio Tools unitypackage into your projects. If your project imports this unitypackage, Unity 5.2 ignores it and directly loads Visual Studio Tools for Unity from its installed location. If you’re already experienced with Unity, you can create a new project or load one of your own. If you’re loading a project that imported the Visual Studio Tools unitypackage to use Visual Studio Tools for Unity with a previous version of Unity, we recommend that you remove it by deleting the UnityVS directory. Otherwise, if you’re new to Unity, start small with a basic tutorial. Visit the Unity Learn page to find tutorials on example projects you can start with and lessons you can learn from to build your own game with Unity. The Unity Learn page has easy-to-follow tutorials for several different games. To enable your project to use Visual Studio Tools for Unity, just set Visual Studio as its external script editor. In the Unity Editor, on the main menu, choose Edit, Preferences; then, in the Unity Preferences dialog, choose External Tools. Next, set the External Script Editor property to the version of Visual Studio you want to use (Visual Studio Tools for Unity must be installed for this version of Visual Studio) and make sure the Editor Attachingproperty is set. To make sure that built-in support for Visual Studio Tools for Unity is now enabled, see the About Unity dialog. In the Unity editor, on the main menu, choose Help, About Unity. If Visual Studio Tools for Unity is installed and correctly configured, you’ll see a message displayed in the lower left-hand corner of the About Unity dialog. Finally, make sure you’ve set a build target through the Build Settings page and that Script Debugging is enabled. Starting with Unity 5.2, the Visual Studio Tools extension menu is no longer needed to launch Visual Studio or to configure Visual Studio Tools for Unity. Instead, once Visual Studio is configured as your external script editor, just choose the script file from the Unity editor and your code will be opened in Visual Studio. Before Unity 5.2, there was no built-in support for Visual Studio Tools for Unity. Instead, each project had to import the Visual Studio Tools unitypackage and configure other project settings in order to use Visual Studio Tools for Unity. If you’re already experienced with Unity, you can create a new project or load one of your own. If you’re starting a new project, import the Visual Studio Tools unitypackage when you create it. If you’re starting from an existing Unity project or you didn’t import the Visual Studio Tools unitypackage when you created the project, you need to import the unitypackage now. In the Unity editor, on the main menu, choose Assets, Import Package, Visual Studio 2015 Tools (you should see an option for the version of Visual Studio you have installed). The final step is to start Visual Studio from Unity. This creates a Visual Studio Solution for your project, and then opens it in Visual Studio. 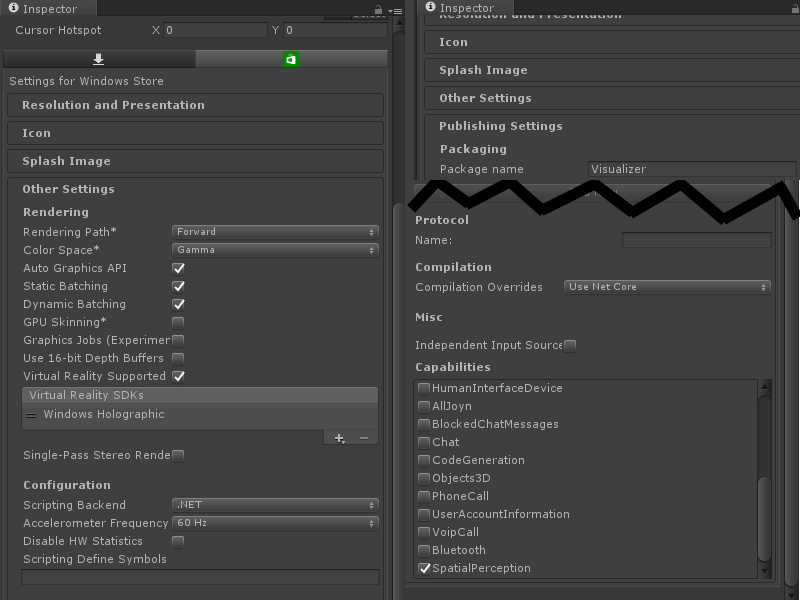 In the Unity Editor, on the main menu, choose Visual Studio Tools, Open in Visual Studio. // update the placement to match the user’s gaze. // Rotate this object’s parent object to face the user. 在右边的 Inspector Panel 中，, 找到 Spatializer Plugin 并选择 MS HRTF Spatializer. // Grab the mesh renderer that’s on the same object as this script.